Choose a times table in the playlist. Start the game and choose a times tables activity. Choose an activity, click on the tick to check your answers, then click on the tick again to continue. Click on "times tables" and choose the tables you want. Play a table tennis times tables game - you have to be quick! You can play on your own or with a friend. Click on the play button, select "Multiply" and choose a level. Print out times tables worksheets, wall charts, games and a recipe! Scroll down to "here's more" and click on the links. Scroll down to "Multiplication skill builders" or "Multiplication". Some activities use Flash and may not work on all browsers. An innovative and interactive guide to learning times tables, with over 125 flaps to lift to discover the answers underneath. Includes tips, tricks and practice questions to help with memorisation, as well as a number machine to answer any tables question. 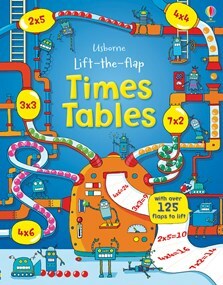 The humorous illustrations and fun questions help children to discover why times tables are helpful, and a challenge at the end encourages them to test their new knowledge. A fun book for parents and children to share together. If your child finds tables boring, they will think again when you give them this book! It's a lively and engaging presentation and children will really respond well to the interactivity. By the end of the book, they will be ready for the Tables Challenge!